It’s クリスマス･イヴ (Xmas Eve) in Japan now. My wife and I went to the Tokyo Sky Tree, the world’s tallest tower, which was illuminated in green for Xmas. 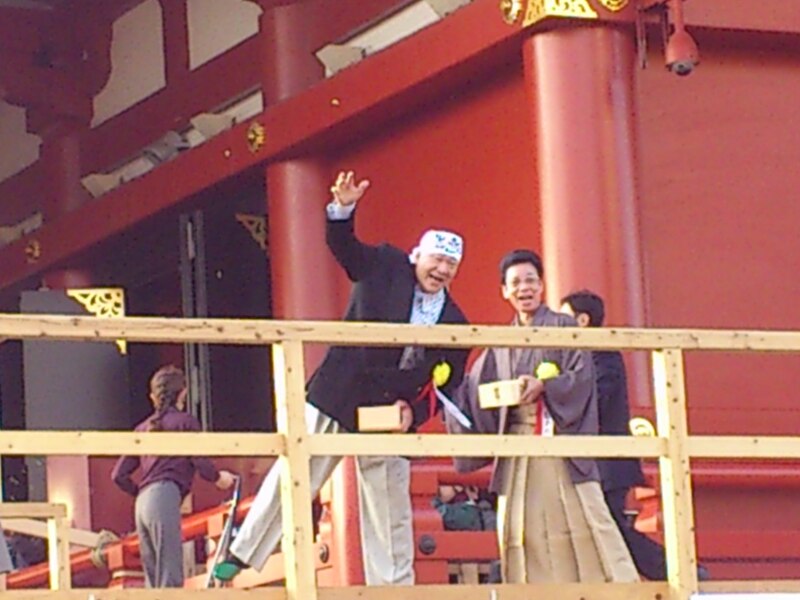 Today is February 3rd … in Japan, it’s a holiday called 節分 (Setsubun). On this day, fathers wear a demon mask and the children throw beans at him and shout 「鬼は外！福は内！」 (“Demon (bad luck) go out! Good fortune come in!”) until he runs away. Then everyone eats the number of beans corresponding to their age (one bean for each year of their age). Also, there is a special sushi people eat on this day. And, at major temples in Japan, there is a ceremony in which celebrities who were born in the current Chinese zodiac year throw beans at the crowd. We went to the famous 浅草寺 (Sensouji Temple) in 浅草 (Asakusa, Tokyo) and caught some beans that were thrown by famous people there. The celebrity that I was most looking forward to seeing was 「アニマル浜口)」 (“Animal” Hamaguchi)! Animal Hamaguchi was a professional wrestler in Japan and then he became the trainer / coach of his daughter, Kyoko, who was a female wrestler that represented Japan at the Olympics and other games. Animal Hamaguchi is well-known for his loud, animated and humorous support and cheering of his daughter! The charismatic “Animal” Hamaguchi throwing beans at the crowd. 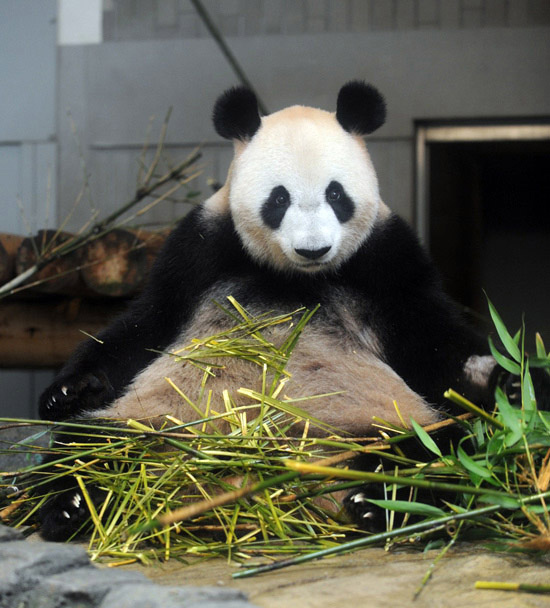 Yesterday (2012 July 5th), Shin-Shin, the female Giant Panda at Tokyo’s 上野動物園 (Ueno Zoo) gave birth to a baby. The proud mother, Shin-Shin, in Tokyo’s Ueno Zoo. (Photo from the Ueno Zoo website). This is the first time that a panda has been born in a zoo in Japan in twenty-four years. That means that the last time a panda was born here was in 1988…two years before I came to Japan. So, this is big news and Ueno Zoo will surely be full of visitors hoping to see the baby panda. Edited on 2012 July 12: It was announced that the newborn baby panda died of pneumonia yesterday. 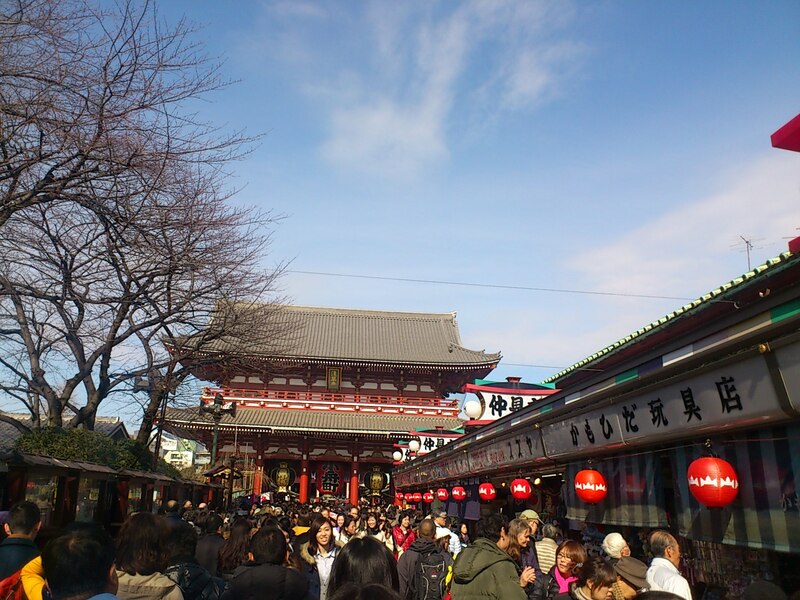 Have you ever been in Japan in early January, just after New Years? Did you notice many stores selling bags (usually red and white) that are sealed shut so no one can see inside them? Do you know what those bags are? They’re called 「福袋」 (“Fukubukuro“). The Japanese word 「福袋」 is normally written on the bags…but sometimes the English words “Lucky Bag” or “Happy Bag” is written on them. 「福袋」 (“Fukubukuro“) translates to “Good fortune bag” or “Lucky bag”. These are a post-New Years tradition in Japan. Most stores offer them. They fill the bags with various items from the previous year’s merchandise that they need to get rid of to make room for new merchandise…and they sell the bags at a big discount—often 50% or more! 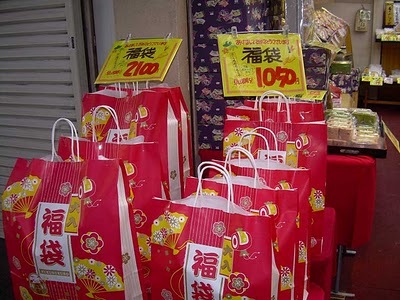 Many stores offer different price ranged bags…usually about ¥3,000, ¥5,000 and ¥10,000. But, of course, some stores 「福袋」 (“Fukubukuro“) could be priced higher or lower depending on the type of items the store sells. This store has two types of "Fukubukuro", priced at ￥1050 and ￥2100. The catch is…customers can’t look inside the bag before the purchase it. Clothing stores will label the bags “Men’s”, “Women’s” or “Children’s” wear and the size of the clothes in the bag. But other than that, the contents are a mystery. Young women and teenage girls love to shop (as the father of three teenage girls…believe me, I know this! ), so 「福袋」 (“Fukubukuro“) from stores that cater to them are especially popular. Every January 2nd, young women line up outside the trendiest women’s fashions stores before they open…and as soon as the doors open, it’s a mad rush to buy the 「福袋」 (“Fukubukuro“)! The 「福袋」 (“Fukubukuro“) from these stores in Tokyo are known to be all sold within two minutes! Then, the young women all can be seen outside the stores looking at the things they’ve just purchased…and trading the items amongst each other. A crowd of young women lining up to buy Fukubukuro at a popular store in downtown Tokyo. Would you buy a 「福袋」 (“Fukubukuro“)? Have you ever bought one? I never buy them…but my daughters like them. They usually buy one every year…including today. In Japan, April 29th, May 3rd, May 4th and May 5th are public holidays. Collectively they are known as 「(ゴールデンウィーク」 (“Golden Week“). Technically only those days are public holidays and therefore only the May 3-5 period is “Golden Week”, but many companies allow their employees to have a Golden Week holiday from 「昭和の日」 (“Showa Day”) on April 29th until 「子供の日」 (“Children’s Day”) on May 5th. Today is May 4th…「みどりの日」 (“Greenery Day“) in Japan. This is the day to appreciate nature. Every year May 4th is one of three days that all of the public 動物園 (zoos) and 水族館 (aquariums) are open with no admission charge. 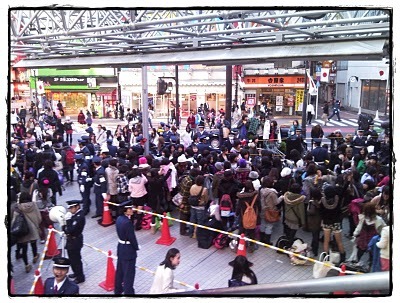 So you can go to the zoo or aquarium in Tokyo for free today…if you don’t mind the crowd. Of the three days that Japan’s zoos are open for free, May 4th is the most crowded because it’s the day that is a national holiday. Tokyo’s 「上野動物園」 (Ueno Zoo) will be particularly crowded because in addition to the zoo being open for free on a national holiday today…Ueno Zoo recently got new pandas. The three days of the year that Japan’s public zoos and aquariums are open for free are May 4th (“Greenery Day”), 都/道/府/県民の日 (Prefecture Residents’ Day) (each prefecture’s “Residents Day” is a separate day), and the anniversary of the day that the zoo / aquarium first opened. –May 4th 「みどりの日」 (Greenery Day)…which is today. –October 1st 「都民の日」 (Tokyo Residents’ Day)…as for the Tokyo’s neighboring prefectures, 千葉県民の日 (Chiba Prefecture Residents’ Day) is on June 15th, 埼玉県民の日 (Saitama Prefecture Residents’ Day) is on November 14th, and 神奈川県民の日 (Kanagawa Prefecture Residents’ Day) is on March 19th—so Chiba Zoo, Tobu Zoo, Yokohama Zoo, etc. will be open for free on their respective prefecture’s Residents Day. Ueno Zoo...open for free every March 20th (first opened on 1882 March 20). Tama Zoo is open for free on both (May 4) today and (May 5) tomorrow (both are national holidays). Tama Zoo first opened on 1958 May 5th. Kasai Seaside Aquarium...open for free every October 10th (first opened on 1989 October 10). Inokashira Zoo...open for free every May 17th (first opened on 1918 May 17). Ooshima Zoo is always opened to the public for free. Do you like zoos and aquariums? Which is your favorite zoo? Have you seen any of Japan’s zoo? If you want any information about these zoos and aquariums in Tokyo (or the ones in the neighboring prefectures), feel free to ask in this post’s comments or e-mail me…I’ve been to them all. (Images in this post are from the Tokyo Zoological Park Society website). Don’t turn your back. Don’t look away. And don’t blink.